Satguru is a title given specifically only to an enlightened sant (saint) whose life’s purpose is to guide others. Satguru Kabir Saheb is considered to be one of the greatest poets as well as mystics ever born in India. He believed that human beings are equal and being one with God is the ultimate aim of every individual. His love and devotion towards the Supreme One clearly reflect in His poetry. His Guru was Ramanand and his disciple was Dharam Das. 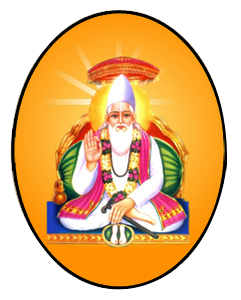 As per the life history of Satguru Kabir Saheb, he was born in 1398 AD. It is said that he was found floating on a lotus leaf in a tank in Banaras by a Muslim weaver. The weaver took the vulnerable child under his care and following the traditional manner, gave him the name of ‘Kabir’, meaning ‘the great one’. Even at a young age, Kabir displayed enormous spiritual talent. The List of Dharam Das Acharya’s(Hajur). Kabir Panth is not only a religion but a way of life. In the sense that you don’t have to convert or be confined into strict rules and restricted ideas to understand and benefit from Satguru Kabir Saheb’s philosophy. Kabir Saheb was raised by a childless couple named Niru and Nimma, who found him near Lahara Tara Lake, adjacent to the holy city of Varanasi. His birth is surrounded by legends. The most popular belief is that being the supreme power, he appeared in form of a baby. He was never “born” as such. He was a Bhakti saint, who sang the ideals of seeing all of the humanity as one, his name, Kabir, is often interpreted as Guru’s Grace. He kept himself away from the fundamentalism of all the religions and explained the root philosophies of spirituality. The land of Varanasi (Kashi) has been the ultimate pilgrimage spot for ages. Often referred to as Benares, Varanasi is the oldest living city in the world. These few lines by Mark Twain say it all: “Benaras is older than history, older than tradition, older even than legend and looks twice as old as all of them put together”. Hindus believe that one who is graced to die on the land of Varanasi would attain salvation and freedom from the cycle of birth and re-birth. Abode of Lord Shiva and Parvati, the origins of Varanasi are yet unknown. The Ganges in Varanasi is believed to have the power to wash away the sins of mortals. Varanasi has also been a great centre of learning for ages. Varanasi is associated with the promotion of spiritualism, mysticism, Sanskrit, yoga and Hindi language and honored authors such as the ever-famous novelist Prem Chand and Tulsi Das, the famous saint-poet who wrote Ram Charit Manas. Aptly called as the cultural capital of India, Varanasi has provided the right platform for all cultural activities to flourish.